Greek thrashers InsIDeaD are around for more then 1 decade, but now in their 13th year they decided to records their debut album Chaos ElecDeaD. Since Suicidal Angels stepped onto the international stage it seems that one or the other band from Greece is give it a try. 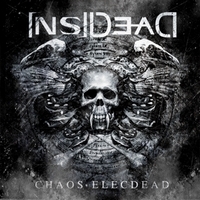 InsIDeaD hooked up with producer R.D. Liapakis and recorded in his Music Factory Studios in Kempten. The opener is called No I.D., the tune is a modern metal tune with thrashy passages, some growls and partly clean vocals. The clean vocals are quite melodic and more based on American modern metal / rock. With Blood 4 Blood they storm off, the song shows references to Sepultura at Roots Bloody Roots... But then a break and they head into a more melodic passage... A groove metal part follows. A sonic roller coaster ride. After the more melodic Time they present the title track, it's almost like listening to two different bands.... For the title track the Greek did a video, so you have the chance to check them out yourself.